For 35 years, Scouts from the Chickasaw Council have honored the veterans buried at the Memphis National Cemetery every Memorial Day by placing American flags at their grave sites. Buddy Crenshaw came up with the endeavor after a Scout, who was seeking ideas for an Eagle Scout project, approached him. The community participation has grown since 1983, and last year, it only took about 20 minutes to place more than 46,000 flags at the cemetery. Scouts in Memphis, Tenn., won’t be the only ones honoring our fallen heroes this Memorial Day. 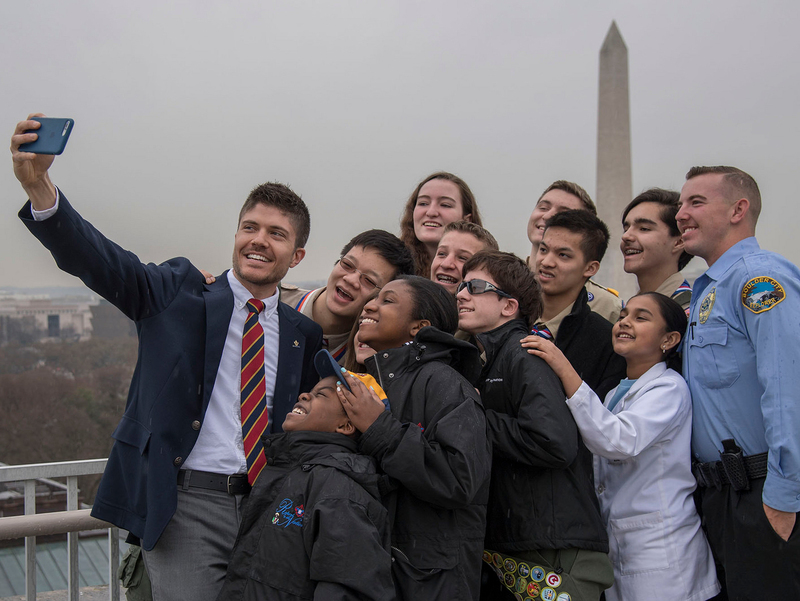 Thousands of Scouts across the country will be participating in ceremonies and placing U.S. flags. You can check with your city, county, local veterans groups as well as national cemeteries to see where and when events will be on Monday, May 28. If your unit wants to place flags at grave sites this year, keep a few tips in mind. Always coordinate with the cemetery’s director when planning to volunteer. The director will know how much help is needed and where that help should be directed. The director might need flags placed at grave sites or along the main entrance, often referred to as an “avenue of flags,” or might not need any help at all. In any case, extend the courtesy of accommodating for your group by reaching out to the cemetery caretaker well in advance of the service day. According to the Department of Veterans Affairs’ National Cemetery Administration, flags placed at graves should be erected in a uniform matter, usually one foot, centered and in front of the headstone or grave marker. For an “avenue of flags” display, flagpoles should be inserted and secured in an in-ground receptacle. The flags shouldn’t interfere with traffic. At national cemeteries, the U.S. flag and the National League of Families POW/MIA flag are allowed to be publicly displayed. Other flags, like state flags, may be flown under certain circumstances, like during a ceremony. Again, check with the cemetery director. For all flag ceremonies, remember to follow the rules of flag etiquette. These include never letting the flag touch the ground and ensuring flags are in excellent condition. Depending on the logistics of decorating a cemetery, the National Cemetery Administration does allow graves to be adorned with flags the weekend before Memorial Day and the flags can be removed shortly after the holiday. With this allowance, flags may not be illuminated at night, which is a deviation from the flag code, but it is an authorized deviation, according to the cemetery administration. When removing flags, make sure they are inspected, dried and stored properly. Volunteering at a cemetery for Memorial Day is a great way to teach Scouts about national and local history, community service and patriotism. It can also be an opportunity to fulfill service hours and rank requirements, but more importantly, it’s a chance to impart a sense of respect for those who have died for our freedoms. Remind Scouts to follow cemetery rules, refrain from rowdiness and to stay on designated paths.